New Photo Gallery is up! At long last, after much color correcting and tweaking in Photoshop, my last round of photography is online. I’ve put some samples on this page, just click any of them and it will take you to the gallery. Or you can just click here. The lovely Michelle Overstreet was my model for the occasion. Her brother Scott (the only other person in any of the photos) was there as well taking pictures. As you might notice the choice to go for color over black and white depends greatly on the total light available as well as the amount of concrete in the shot. On the whole I think they turned out quite well. I was able to do some tricks with lighting I haven’t tried before, and the fiddler against the city skyline remains a solid idea. I particularly like the use of the Flash (on the later shots) and the cool golden glow the lighter provided. In post processing I created several utility Photoshop Actions (I’ll post those later) which sped up the color corrections and image resizing a great deal. All of these were taken last Saturday on either Bishop Street in Midtown (near Atlantic Station, or at the North Highland bridge downtown. For my non-local readers, these locations are about five miles apart from each other in Atlanta. We started about 7:00 PM and went to 9:45. With the exception of the black and white conversion, cropping and color corrections, almost nothing was done in Photoshop. A full gallery to come, when I have time to go through them all. With the help of the lovely and talented Kathy Leland I was able to get the closest yet to the fiddler in silouette. This is far and away the best batch so far. 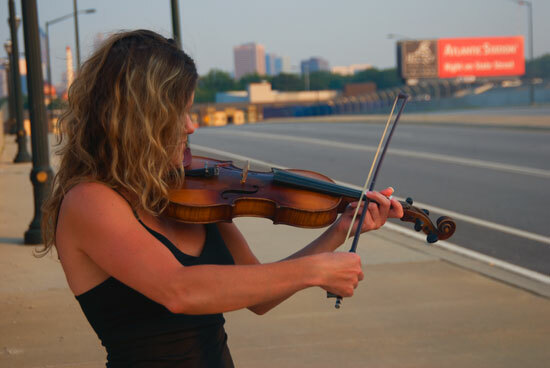 She is also, to date the only actual fiddler to model for the fiddler series. I just posted the photos I took on Saturday night. The goal of the project is to capture pictures of people silhouetted against interesting backgrounds. These turned out a bit noirish but on the whole I like them. Definitely too much foreground lighting for good silhouettes though.